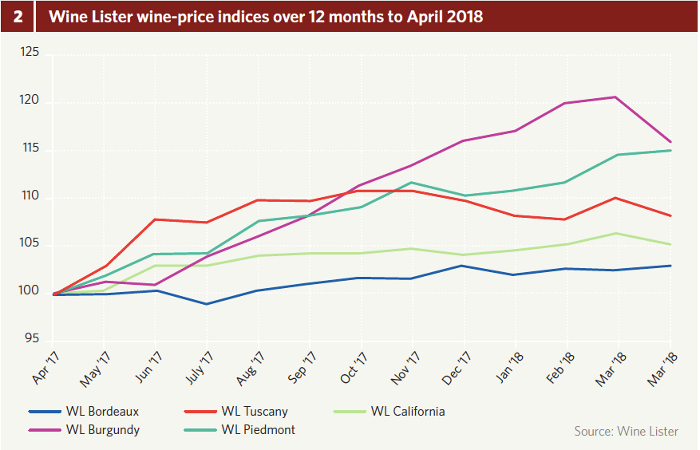 Wine prices for the very top wines started to lose momentum in December 2017 and stagnated in the first quarter of 2018. Continuing the pattern seen in 2017, however, a broader set of wines has proved a better investment than a arrow, Bordeaux-focused one. 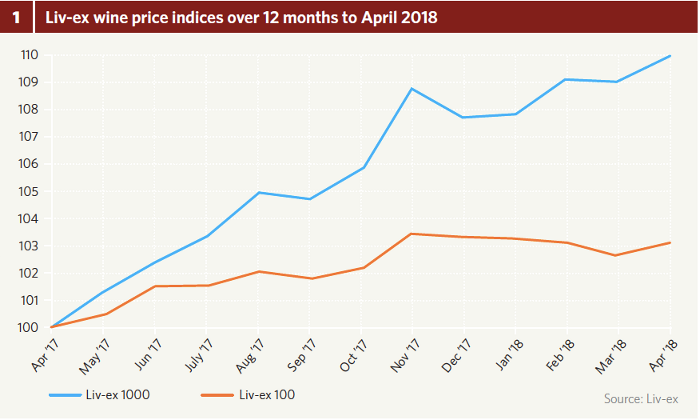 The Liv-ex 1,000 has gained 10 percent over the 12 months to April 30, 2018, compared to just 3 percent for the Liv-ex 100, made up of less varied components (fig.1). Indeed, the gap between these two measures has widened over the past five months, as the broader index has continued to climb. The Wine Lister wine price indices shown in figure 2 are composed of the top five brands in each region. The five Bordeaux first growths gained just 3 percent over the 12-month period to April 2018. Meanwhile the top five brands from Burgundy and Piedmont gained, on average, 16 percent and 15 percent respectively, comfortably outperforming the rest of the market. Tuscany and California, meanwhile, sat within the range of the wider market. Bordeaux’s trade share on wine trade exchange Liv-ex fell to an all-time low of 51 percent in January, with attention on Burgundy 2016 en primeur. It picked up in February and reached 64 percent in March, thanks to trading of recently bottled and rescored 2015s, and perhaps also in anticipation of the Bordeaux 2017 en primeur campaign as it became clear that the vintage was far from being a disappointment, even though not at 2016 levels. Still, Bordeaux—especially in older vintages—remains at the core of the fine-wine business. “We have been focusing our buying on repurchasing stock sold to our own customers,” explains Browett. “This has resulted in many great wines coming back onto the market,” he continues, specifically referencing “a 1,000-case parcel of 2000 Bordeaux that a private customer bought from us en primeur.” All in all, news from the ground is positive. “The first four months of 2018 have been good for Farr Vintners, with sales slightly up on the same period last year,” reports Browett. For the complete version of Liquid Assets, please refer to Issue 60 of the print magazine.